Voraussetzungslose Ausbildung zur Bearbeitung von Audio-Dateien zum Fremdspracherwerb. Bewerber brauchen keine Vorkenntnisse, jedoch Passion und Geduld am PC und sollten Übung im Umgang mit 2 Sprachen haben (oder mehr). Auch Kreativität im Bereich Musik kann Anwendung finden. Der Audio-Language-Decoder ist ein neuer Beruf der Kreativitätswirtschaft. Persönliche Stärken: Auffassungsfähigkeit/-gabe, Lernbereitschaft, Selbständiges Arbeiten, Sorgfalt/Genauigkeit, Zielstrebigkeit/Ergebnisorientierung. Geboten werden interkulturelle Perspektiven und Auslanderfahrungen auf der Grundlage der jüngsten und erfolgreichsten technischen Erfindung für Fremdspracherwerb: PLUG & SPEAK: Sprachen lernen ohne Zeit! Sommerkurs in der Lausitz: Arbeit, Freizeit Bildung: „Plug & Speak: Sprachen lernen ohne Zeit“ heißt der Zusammenschluss von Gehirnforschung und Fremdsprach-Immersion: erst zuhören während Arbeit, Sport und Freizeit, dann selber anwenden. Fernkurs: Einführung in die Entwicklung und Produktion dekodierter Audiodateien für Fremdsprcherwerb mit persönlicher Begleitung. Bei erfolgreichem Anschluss vor dem 1. September, Option der Ausbildung als ECVET qualifizierter Fremdsprach-Dekodierer. Audio-Sprachlern-Paket für die Sommerferien den Englischlehrern von 62 Schulen in Baden-Württemberg und 80 Schulen aus anderen Bundesländerndernin vorgestellt. Präsentation von "iTongue Plug & Speak: Fremdsprachen lernen ohne Zeit" im Zentrum für kulturelle Integration des Roten Kreuzes in Genf. Kooperationsvereinbarung mit der Arbeitsstellen für Bildung, Integration und Demokratie Sachsen im Dienste der Integration von Zuwanderern: "Energie durch Sprache: Europäischer Zusammenhalt durch Spracherwerb mittels beispielhafter Lebensheschichten"
Nominee für Advocate-Europe mit "Powered by Language"
Der Fremdsprach-Dekodierer ist ein neuer Beruf des elektronischen Zeitalters. Entwicklung und Produktion dekodierter Audiodateien mit wissenschaftlichen Hintergrundinformationen. Zertifikat der europäischen Programme der lebenslangen informellen Bildung. Anmeldung erforderlich, Teilnehmerzahl begrenzt. Einführung in neurologische Hintergründe und elektronische Umsetzung der Audio-Sprachdekodierung. Die von Vera F.Birkenbihl entwickelte Methode der Dekodierung hat sich auf dem deutschsprachigen Markt innovativer Lehrmittel zum Fremdspracherwerb seit 2 Jahrzehnten durchgesetzt. Hier wird das Prinzip nun Dank entsprechender Ergebnisse der Gehirnforschung im Audio-Bereich weitergeführt. No time? Learning foreign languages without time! Development and production of new foreign language learning material with Scientific background information. Linguists, musicians, IT technicians, speakers as well as amateurs are welcome to increasing their competences and obtain qualifications of the European informal life long learning programs for new and creative professions of the electronic age. Workshop on Good and Bad Practices in Language Teaching – collection of DOs and DON’Ts lead by TLV Foundation. Mini-workshop on Autorhytmy. Sharing experiences on: the 7 principles of learning a foreign language by Lazarov; the role of music in teaching; coaching and learning; kinesiology as a facilitator in the learning process. Presentation of Good Examples. Ideas for the Advanced decoded video. Workshops: Experiences with Decoding Method 19th december 2013, 19th February 2014, 24th June 2014. The 7 life-processes vs the 7 learning processes – how to use the decoding method on Hungarian texts and contents. A pilot video has been created and tested together. Sharing experiences and knowledge: Hungarian grammar is not a really good object to be tought with this method, at least not on beginner level. Advanced video is to be created. Practical part at home. Consulting by request (3 academic hours). Working session 4 - Final discussion. Partners from Switzerland and Hungary were invited to join the discussion using SKYPE! It didn’t succeed because of technical matters. After the final discussion, some conclusions were suggested, based on things discussed and learnt during the study weekend, like Freedom in creation iTongue results (every country can choose what texts and products would be suitable for their learners and for their institution), Availability of the products online (all products must be uploaded online, so that every partner could find and use it), survey (survey on the effectiveness and attitudes of learners should be implemented), sharing experiences (partners should share the experiences not only connected with the project but with language learning/teaching and using various methods as well). Evaluation of the meeting. Working session 3 - Coordinators‘ meeting. The following questions were discussed: survey, partners’ agreement, project website, agenda of London meeting, development of workshop curriculum. Working session 2 - Disscussion on the iTongue results. At the beginning the discussions in 3 mixed groups were organised. The task was to discuss iTongue products presented by partners and to find out what was positive and useful as well as valuable and what could be done in another way. Working session 1 – Presentations of iTongue project partners. As the partners‘ institutions were not presented it was decided in Portugal meeting that the partner could do it during the 3rd meeting. Of course it was expected that the products / decoded learning material would be presented as well. Before the partners started the presentations they were asked to make notes (what was positive and useful as well as valuable and what could be done in another way...) about decoded products presented by others. Poland Lipiec 2015 Prace związane z napisaniem raportu końcowego dla Narodowej Agencji. Uzupełnienie wszelkich informacji o projekcie w bazie EST. Końcowa dyseminacja projektu na stronie internetowej Agencji Usług Lingwistycznych Logmar. Czerwiec 2015 Zebranie grupy roboczej w Logmar 17 czerwca w celu podsumowania projektu. Prezentacja wszystkich produktów, materiałów, tłumaczeń oraz przykładów dekodowanych tekstów-piosenki itongue. Kwiecień 2015 Zebranie grupy roboczej w projekcie itongue, przygotowanie mobilności na Węgry. Przygotowanie prezentacja Hello Brain. Marzec 2015 Przygotowanie artykułu „Rybniczanie w unijnych projektach”, który ukazał się w kwietniowym numerze Gazety Rybnickiej. Styczeń 2015 W dniu 19 stycznia odbyło się zebranie pracowników Agencji dotyczące przygotowania mobilności do Turcji. Podczas burzy mózgów zdecydowano o przygotowaniu prezentacji na temat metody nauczania języków Dedomodo. Październik 2014 Wszystkie produkty końcowe zostały udostępnione grupie testowej oraz poddane ewaluacji. Wrzesień 2014 Dwa nowe produkty w projekcie „iTongue: Our Multilingual Future” właśnie zostały ukończone. Zapraszamy do zapoznania się Green Juice oraz Seniors wake up. Lipiec - sierpień 2014 W lipcu i sierpniu trwały intensywne prace nad przygotowaniem kolejnych produktów końcowych w projekcie w kategoriach Elementary oraz Intermediate. Zaangażowani byli lektorzy naszej szkoły, którzy podłożyli głos do angielskiej wersji tekstu. 9th Nov 2013 Presentationof the project at the Municipal Congress of the educational work in Almada Municipality. Network Multi-Média Formation d’édition de fichiers audio pour l'apprentissage de langues. Le décodeur de langues est une nouvelle profession des industries créatrices. Les candidats n’ont pas besoin de connaissances préalables d’édition de fichiers audio. Cependant, passion et patience travaillant sur l'écran est nécessaire ainsi qu’une expérience de communication dans deux langues (ou plus). La formation sera modulaire. Les crédits respectifs sont certifiés par le système européen de validation ECVET. Création d’un flyer sur le projet iTongue et envoi aux institutions genevoises qui travaillent dans le domaine de la formation des adultes. Présentation duprojet iTongue à Genève par l’association Solid’Artainsi qu’un des films réalisé dans ce cadre. Le projet iTongue vise à créer des supports multimédias ludiques d’apprentissage des langues. Comment apprend-on les langues étrangères? Qu'est-ce qui se passe dans le cerveau? 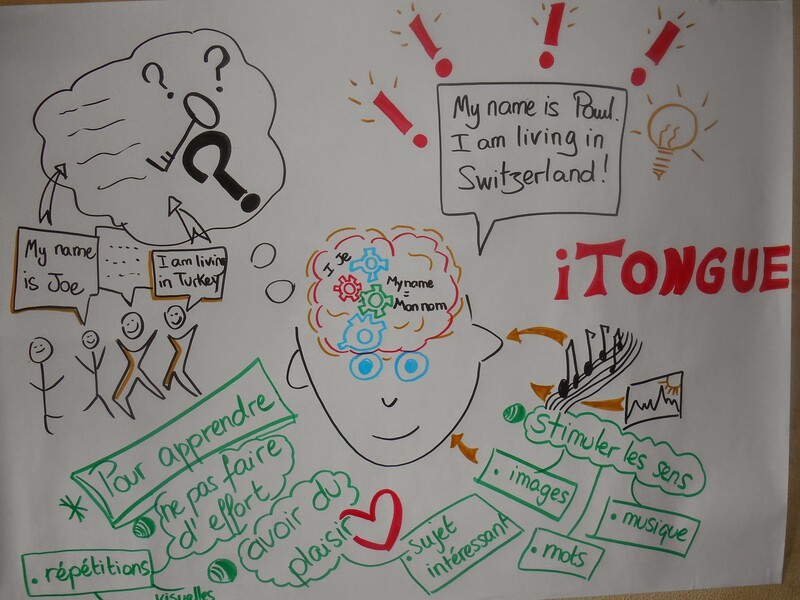 Comment apprendre facilement et avec plaisir? C'est autour de ces questions que le projet iTongue a rassemblé sept pays partenaires, des formateurs d'adultes et des dizaines d'apprenants. Il a permis un partage d’expériences et la production de supports pédagogiques multimédias innovants selon la méthode de la pédagogue allemande Vera Birkenbihl. Les différents partenaires, spécialisés pour la plupart dans l’apprentissage des langues étrangères, ont développé du matériel d’apprentissage qu’ils ont pu tester dans leurs cours. Ce projet se base sur les découvertes récentes en neurosciences. Apprentissage de la technique du décodage. Apprentissage des techniques de montage audio et videos. Language learning innovations with video and digital technology. Learning foreign languages without time! 30.10. -02.11. 2014 Development and production of new foreign language learning material with Scientific background information. Linguists, musicians, IT technicians, speakers as well as amateurs are welcome to increasing their competences and obtain qualifications of the European informal life long learning programs for new and creative professions of the electronic age.